Social media websites and apps such as Facebook, Instagram, Snapchat, Twitter, Google+ and LinkedIn are getting more and more popular by the day! According to the 2017 Sensis Social Media Report, 79% of Australians now use social media. Basically every Aussie under the age of 39 (over 96%) has some kind of social media account, and even 47% of Aussies aged over 65 are getting in on the action! While some companies have very clear Privacy Statements (including our very own), others don’t. Thankfully, that’s starting to change as more social media companies are feeling the pressure from their users to make privacy easy to understand. In light of the recent Facebook-Cambridge Analytica data scandal, more and more people are asking questions about how their privacy is affected when they use social media – which is a good thing. It’s important to understand what companies can and can’t do with your personal information on social according to their own user agreements. Given the amount of personal information the average user posts on social media, there’s no time like the present to get on top of your privacy settings in your social media profiles. We’ve put together some top tips based on the latest privacy updates on popular social media platforms. If you’ve got Facebook, Twitter, Instagram or even a Google account (YouTube, anyone? ), have a read to see if there’s anything you can do to tidy up your profile settings. Any long-time users of Facebook, particularly those who were around in the mid-2000s, are likely to have dozens upon dozens of third-party app permissions littering their profile settings. From fun quizzes and competitions to the notorious Farmville, chances are that today, there’s only a handful of apps that you actually want to have access to the information on your Facebook profile. 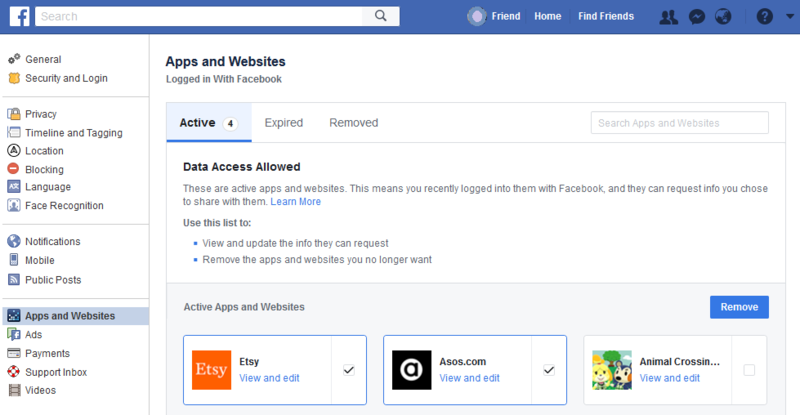 Allowing data access for apps and websites means that you recently logged in to them using Facebook, and they can request information you’ve chosen to share with them. Click the down arrow icon in the top right-hand corner and select Settings. Beneath “Active Apps and Websites”, you can tick the box for any old and/or unwanted applications and click Remove. If you want to change the permissions for a certain app or website, click View and edit. Remember to hit Save once you’re done! Click the three-lines icon and select Settings & Privacy. On this page, you can tick the box for any old and/or unwanted applications and click Remove. If you want to change the permissions for a certain app or website, click View. Remember to hit Save once you’re done! Have you heard about Facebook’s facial recognition features? You may be familiar with the way Facebook can recognise a face in a photo which can help you tag your friends in group pics, but did you know that Facebook can recognise the person in the photo and match it up with other photos, even when you haven’t been tagged? Facebook’s latest facial recognition features were built to help you find other photos you may be in (especially if someone else is using your photo as their profile pic!) but you may prefer to disable it if it makes you feel uncomfortable. Check out this article to learn more about Facebook’s facial recognition and how to turn it off. Ever been looking at products online and then suddenly ads for the same thing start appearing on other websites? 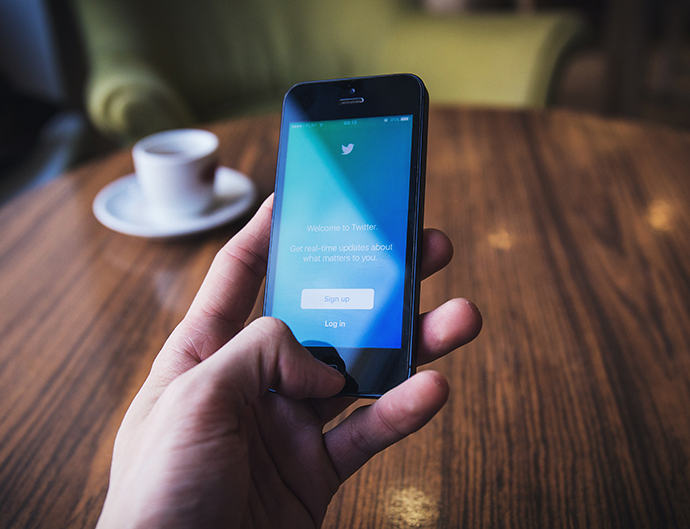 If you’re a regular Twitter user, you’ll know that it’s not uncommon to see advertisements for businesses in your area or for products you’ve recently researched online. This is because by default, the ads you see are personalised based on things like your online activity, other apps you have installed on a device, or places you’ve visited – spooky right? Click your user icon and select Settings and privacy from the menu. Scroll down until you see “Personalisation and Data”. Click Edit. On this page, you can tick/untick certain permissions according to your preferences. To get rid of the lot, simply hit Disable all. You’ll need to select “Yes, I’m sure” in the pop-up window to confirm your decision. Be sure to click the Save changes button at the bottom of the page once you’re done. On this page, you can enable or disable certain permissions according to your preferences. To get rid of the lot, turn off the Personalization and data switch at the top of the page. You’ll need to select “Yes, I’m sure” in the pop-up window to confirm your decision. That’s all there is to it! Your changes will save automatically. 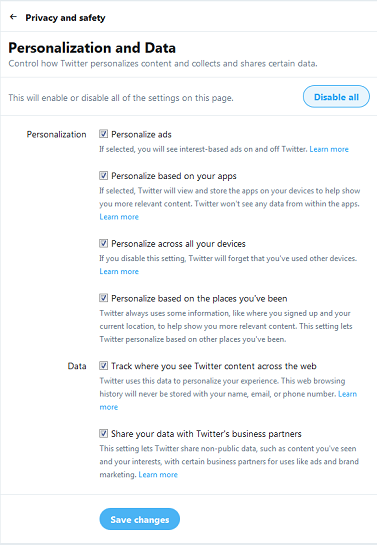 If you use Twitter on more than one device, such as your desktop PC and you phone, it’s worth double-checking these settings on all devices as some people have reported that they needed to change the setting on each device. Anyone who’s ever made an Instagram account will know that many “followers” on the app are actually just bots trawling the internet for certain content or hash tags that relate to recent posts or tags. Sometimes these situations make sense; for example, if you post a photo of a cupcake tagged “baking life #cupcake”, it wouldn’t be surprising if a website selling bakeware followed you. Others make… less sense. While we may never unravel the mystery as to why a business consultancy would follow someone who just posted a piece of embroidery, we do know how to give unwanted Insta followers the boot. There are two ways to do this; it depends on whether you want to keep your profile public, or make it private. When your profile is public, your only option is to block them so they are not allowed to follow you. Click the person icon in the bottom right-hand corner. Tap the three-dots icon in the top right-hand corner. Scroll down until you see Private Account, and turn on the switch for this setting. Your change will be saved automatically. It’s worth noting that any existing followers won’t be affected by this change, so you’ll need to block any unwanted followers to stop them seeing your posts. Click the person icon in the top right-hand corner of the page. Click the cog icon next to the “Edit profile” button, then select Privacy and Security. Tick Private Account. Your change will be saved automatically. Google has fingers in a lot of pies across the internet. While you may not personally use obviously Google-branded services such as Gmail and Google Docs, chances are that if you use YouTube, you have a Google account. Google, who acquired YouTube in 2006, now requires a Google account to log in to YouTube and any old YouTube accounts were converted into Google accounts. Under “Sign-in & Security”, select Apps with account access. 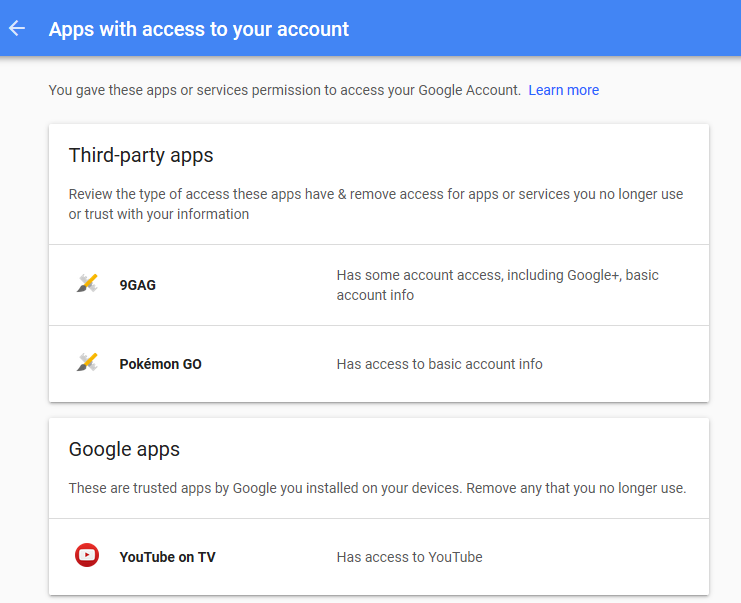 Under “Apps with access to your account”, you’ll see a list of all the apps you’ve given permission to access your Google Account. If you spot any you want to remove, select MANAGE APPS. To remove any app, simple click on it and hit the REMOVE ACCESS You’ll need to click “OK” in the pop-up window to confirm your decision. What’s your top tip for keeping your social media private? Tell us in the comments. Thanks for this, was a good reminder. May I suggest notifying your customers to disable facial recognition on facebook? Thanks for the tip, Jani! This was news to me too. I’ll add a link to an article that will help people understand how facial recognition works and what they can do to disable it. Thanks – this is a very informative bulletin. How is it that you were able to send it to me at my e-mail address? My guess is that my e-mail address sort of belongs to iinet via netspace? This is correct. When we acquired Netspace may years ago, we migrated all Netspace customers into our own systems. Having said that, you are always able to control what you receive from us, via the contact preferences option, in Toolbox (https://toolbox.iinet.net.au).